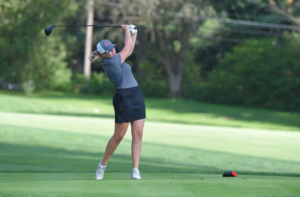 The girls’ golf team is having another banner year and a large part of the reason for that is because of two very talented freshmen, Nina Busch and Erin Drahnak. These girls, along with a cast of other dedicated players, have earned the WPIAL Class 3A section 4 champions’ title and went into October with an undefeated section record of 10-0. They will take that record to the WPIAL team semi finals on October 8. As younger members of the team, Nina and Erin weren’t really expecting this level of notoriety in their first year of high school. 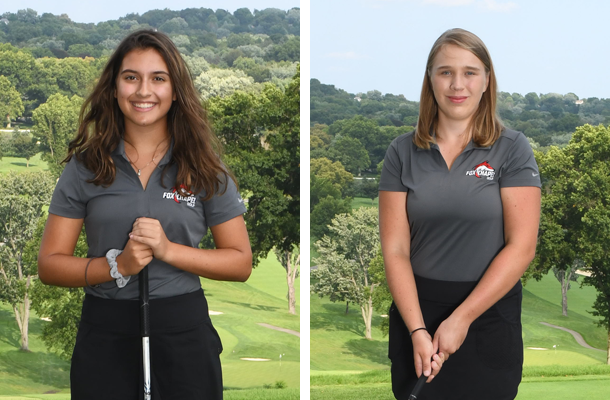 They will make their first-ever appearance at the WPIAL Class 3A individual finals on October 3 at Diamond Run Golf Course in Sewickley. The lowest seven scores, as long as they are under 100, will progress to the Western Regional finals on October 15 at Tom’s Run Golf Course. The top 11 players then move on to the PIAA championship. For Nina, her determination to do well meant a big-time commitment over the summer. 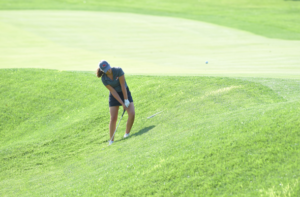 She spent about three hours a day, six days a week practicing and playing, and entered some tournaments, among them the Pennsylvania State Women’s Golf Association Amateur Championships held at the Fox Chapel Golf Club. She won the amateur second flight. She’s also earned the Most Improved Player Award at her golf club for the past two years, and has fared very well in U.S. Kids tournaments. When the season started, Nina modestly says she didn’t know if she’d even play in many matches. But she’s done exceedingly well as a freshman and credits part of it due to her golf-oriented family and playing hundreds of rounds with her dad. As the WPIAL event draws close, she is welcoming his thoughts. Erin is taking an aggressive approach to her first WPIAL championship experience. She played on the 18-hole Sewickley course for the first time on the Saturday before the finals, and competed in a U.S. Kids tournament near Slippery Rock the same weekend. Erin says her focus after joining the high school team has not been so much one of getting to the individual WPIAL or state championships, but more on achieving personalized objectives and the steps she needed to take to improve. “My goals were to get par on course and improve my short game. I feel I’ve very much improved my short game and am very close to par, and I did break 80 this summer on an 18-hole course,” says Erin, who was about 10-years-old when people started to notice she had a gift for golf. Erin also has been active on the tournament circuit. One her most recent first-place wins came at a local U.S. Kids Golf tournament and she’s also played in other large youth championships in numerous states and in Canada. Over the summer, she placed third among all 14-year-olds at the 2018 U.S. Kids Golf Canadian invitational, and has played very well at U.S. Kids Teen World tournaments too. When it comes to the WPIAL finals, however, Erin is taking a rather philosophical attitude for someone who has experienced much success early on. Whether it’s at the 2018 team or individual girls’ golf championships, one thing is for sure: the players and Coach Broderick are to be congratulated for a great year that, hopefully, will run even longer. Facility: Schenley Oval Visit foxchapelarea.bigteams.....92058 for more information! Facility: DMS Gym Visit foxchapelarea.bigteams.....75557 for more information! Facility: Hampton High School Visit foxchapelarea.bigteams.....09021 for more information! Facility: Hampton High School Visit foxchapelarea.bigteams.....09006 for more information! Facility: FCHS - Softball Field Visit foxchapelarea.bigteams.....41432 for more information! Facility: FCHS - Baseball Field Visit foxchapelarea.bigteams.....31711 for more information! Facility: FCHS New Gym Visit foxchapelarea.bigteams.....44990 for more information! Facility: FCHS - Softball Field Visit foxchapelarea.bigteams.....41439 for more information! Facility: FCHS Burk Stadium Visit foxchapelarea.bigteams.....08980 for more information! Facility: FCHS - Baseball Field Visit foxchapelarea.bigteams.....31722 for more information! Facility: FCHS - Baseball Field Visit foxchapelarea.bigteams.....10940 for more information! Facility: FCHS Tennis Courts Visit foxchapelarea.bigteams.....91227 for more information! Facility: FCHS Tennis Courts Visit foxchapelarea.bigteams.....91269 for more information! Facility: FCHS - Softball Field Visit foxchapelarea.bigteams.....99988 for more information! Facility: USC TENNIS CENTER Visit foxchapelarea.bigteams.....91285 for more information! Facility: Alpha Tennis & Fitness Visit foxchapelarea.bigteams.....91320 for more information! Facility: North Allegheny High School Visit foxchapelarea.bigteams.....45003 for more information! Facility: Shaler Area MS Visit foxchapelarea.bigteams.....75591 for more information! Facility: FCHS Burk Stadium Visit foxchapelarea.bigteams.....09031 for more information! Facility: FCHS - Baseball Field Visit foxchapelarea.bigteams.....45896 for more information! Facility: FCHS - Softball Field Visit foxchapelarea.bigteams.....41497 for more information! Facility: Woodland Hills High School Visit foxchapelarea.bigteams.....14481 for more information! Facility: FCHS Burk Stadium Visit foxchapelarea.bigteams.....09041 for more information! Facility: FCHS - Baseball Field Visit foxchapelarea.bigteams.....45911 for more information! Facility: FCHS Burk Stadium Visit foxchapelarea.bigteams.....18020 for more information! Facility: FCHS Burk Stadium Visit foxchapelarea.bigteams.....18056 for more information! Facility: North Allegheny High School Visit foxchapelarea.bigteams.....45016 for more information! Facility: FCHS - Softball Field Visit foxchapelarea.bigteams.....41661 for more information! Facility: FCHS - Softball Field Visit foxchapelarea.bigteams.....41717 for more information! Facility: FCHS New Gym Visit foxchapelarea.bigteams.....45032 for more information!